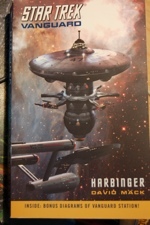 “Harbinger” is the first book of the series and takes place right at the - except for a small excurse to the year 2263 - right after the TOS episode “Where no man has gone before” where Kirks friend Gary Mitchell died. During the course of this book, the reader gets to know the personnel onboard Starbase 47 commanded by Commodore Diego Reyes. Actually, from what I’ve seen so far, all the SB47 characters are completely new to the Star Trek universe. That said, there are quite a few guest appearances in this book. Right in the first chapter Commodore Matt Decker - who was introduced in the TOS episode “The Doomsday Machine” - provides the reason for building SB47. Then the Enterprise docks to get some repairs after the incident with Gary Mitchell and Elisabeth Dehner on Delta Vega. These first two chapters are used to somehow put the whole story into a right timeframe followed by an a little bit slow paced introduction of the main characters like the smugler Cervantes Quinn. But right after these introction chapter the story plays like a spy thriller with more than enough action. And David Mack definitely knows how to write an action sequence. If you’re looking for comedy, you will perhaps be a little bit disappointed, because apart from Kirk’s remarks about the new women uniforms (miniskirts if you don’t remember them anymore from TOS) the whole story is very serious … just like you’d expect from a spy thriller. I normally don’t like the TOS universe (< the first movie) simply because of the strange … well, let’s just say I don’t like it. But this book was really great. Actually except for the first few pages, the whole story was never boring.